“You could not possibly have come at a better time, my dear Watson,” he said, cordially. I did not gain very much, however, by my inspection. Our visitor bore every mark of being an average commonplace British tradesman, obese, pompous, and slow. He wore rather baggy gray shepherd’s check trousers, a not over-clean black frock coat, unbuttoned in the front, and a drab waistcoat with a heavy brassy Albert chain, and a square pierced bit of metal dangling down as an ornament. A frayed top hat and a faded brown overcoat with a wrinkled velvet collar lay upon a chair beside him. Altogether, look as I would, there was nothing remarkable about the man save his blazing red head and the expression of extreme chagrin and discontent upon his features. “Yes, sir. He and a girl of fourteen, who does a bit of simple cooking, and keeps the place clean – that’s all I have in the house, for I am a widower, and never had any family. We live very quietly, sir, the three of us; and we keep a roof over our heads, and pay our debts, if we do nothing more. “‘Why, what is it, then?’ I asked. 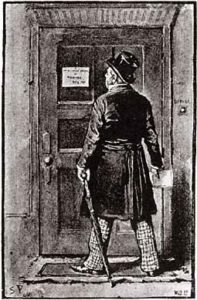 You see, Mr. Holmes, I am a very stay-at-home man, and, as my business came to me instead of my having to go to it, I was often weeks on end without putting my foot over the door mat. In that way I didn’t know much of what was going on outside, and I was always glad of a bit of news. “‘Have you never heard of the League of the Red-headed Men?’ he asked, with his eyes open. “Now it is a fact, gentlemen, as you may see for yourselves, that my hair is of a very full and rich tint, so that it seemed to me that, if there was to be any competition in the matter, I stood as good a chance as any man that I had ever met. Vincent Spaulding seemed to know so much about it that I thought he might prove useful, so I just ordered him to put up the shutters for the day, and to come right away with me. He was very willing to have a holiday, so we shut the business up, and started off for the address that was given us in the advertisement. “There was nothing in the office but a couple of wooden chairs and a deal table, behind which sat a small man, with a head that was even redder than mine. He said a few words to each candidate as he came up, and then he always managed to find some fault in them which would disqualify them. Getting a vacancy did not seem to be such a very easy matter after all. However, when our turn came, the little man was much more favorable to me than to any of the others, and he closed the door as we entered, so that he might have a private word with us. “‘It would be injustice to hesitate,’ said he. ‘You will, however, I am sure, excuse me for taking an obvious precaution.’ With that he seized my hair in both his hands, and tugged until I yelled with the pain. ‘There is water in your eyes,’ said he, as he released me. ‘I perceive that all is as it should be. But we have to be careful, for we have twice been deceived by wigs and once by paint. I could tell you tales of cobbler’s wax which would disgust you with human nature.’ He stepped over to the window and shouted through it at the top of his voice that the vacancy was filled. A groan of disappointment came up from below, and the folk all trooped away in different directions, until there was not a red head to be seen except my own and that of the manager. “My face lengthened at this, Mr. Holmes, for I thought that I was not to have the vacancy after all; but, after thinking it over for a few minutes, he said that it would be all right. 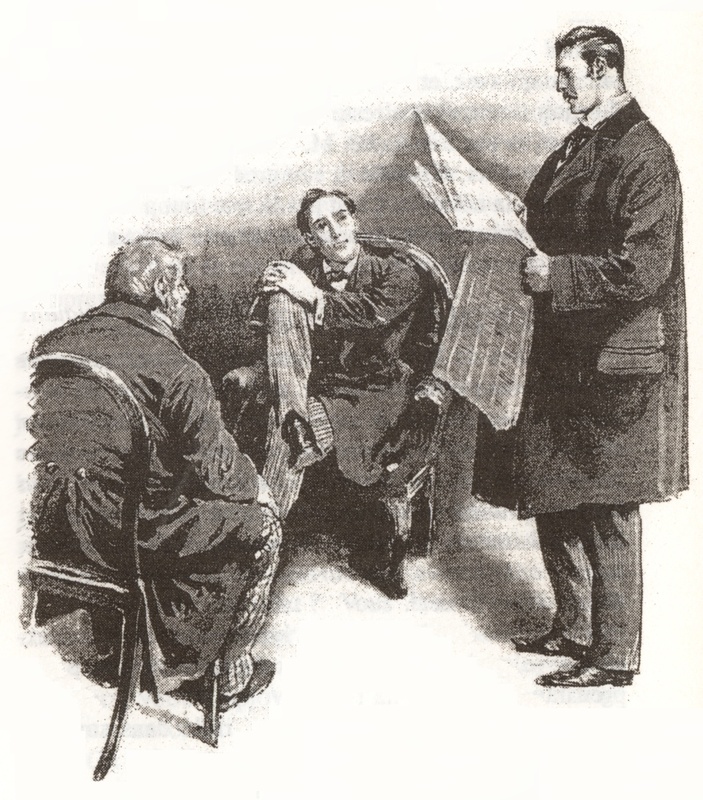 “Now a pawnbroker’s business is mostly done of an evening, Mr. Holmes, especially Thursday and Friday evenings, which is just before pay day; so it would suit me very well to earn a little in the mornings. Besides, I knew that my assistant was a good man, and that he would see to anything that turned up. “‘Then, good-by, Mr. Jabez Wilson, and let me congratulate you once more on the important position which you have been fortunate enough to gain.’ He bowed me out of the room, and I went home with my assistant hardly knowing what to say or do, I was so pleased at my own good fortune. “Well, I thought over the matter all day, and by evening I was in low spirits again; for I had quite persuaded myself that the whole affair must be some great hoax or fraud, though what its object might be I could not imagine. It seemed altogether past belief that anyone could make such a will, or that they would pay such a sum for doing anything so simple as copying out the ‘Encyclopaedia Britannica.’ Vincent Spaulding did what he could to cheer me up, but by bed time I had reasoned myself out of the whole thing. However, in the morning I determined to have a look at it anyhow, so I bought a penny bottle of ink, and with a quill pen and seven sheets of foolscap paper I started off for Pope’s Court. “Well, to my surprise and delight everything was as right as possible. The table was set out ready for me, and Mr. Duncan Ross was there to see that I got fairly to work. He started me off upon the letter A, and then he left me; but he would drop in from time to time to see that all was right with me. At two o’clock he bade me good-day, complimented me upon the amount that I had written, and locked the door of the office after me. “THE RED-HEADED LEAGUE IS DISSOLVED. “To smoke,” he answered. “It is quite a three-pipe problem, and I beg that you won’t speak to me for fifty minutes.” He curled himself up in his chair, with his thin knees drawn up to his hawklike nose, and there he sat with his eyes closed and his black clay pipe thrusting out like the bill of some strange bird. 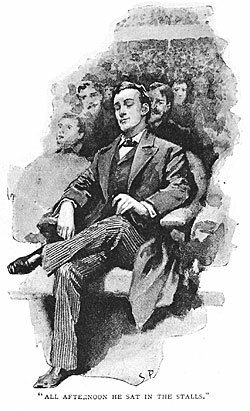 I had come to the conclusion that he had dropped asleep, and indeed was nodding myself, when he suddenly sprang out of his chair with the gesture of a man who has made up his mind, and put his pipe down upon the mantelpiece. We traveled by the Underground as far as Aldersgate; and a short walk took us to Saxe-Coburg Square, the scene of the singular story which we had listened to in the morning. It was a poky, little, shabby-genteel place, where four lines of dingy, two-storied brick houses looked out into a small railed-in inclosure, where a lawn of weedy grass, and a few clumps of faded laurel bushes made a hard fight against a smoke-laden and uncongenial atmosphere. Three gilt balls and a brown board with JABEZ WILSON in white letters, upon a corner house, announced the place where our red-headed client carried on his business. Sherlock Holmes stopped in front of it with his head on one side, and looked it all over, with his eyes shining brightly between puckered lids. Then he walked slowly up the street, and then down again to the corner, still looking keenly at the houses. Finally he returned to the pawnbroker’s and, having thumped vigorously upon the pavement with his stick two or three times, he went up to the door and knocked. It was instantly opened by a bright-looking, clean-shaven young fellow, who asked him to step in. “Third right, fourth left,” answered the assistant, promptly, closing the door. My friend was an enthusiastic musician, being himself not only a very capable performer, but a composer of no ordinary merit. All the afternoon he sat in the stalls wrapped in the most perfect happiness, gently waving his long thin fingers in time to the music, while his gently smiling face and his languid, dreamy eyes were as unlike those of Holmes the sleuth-hound, Holmes the relentless, keen-witted, ready-handed criminal agent, as it was possible to conceive. In his singular character the dual nature alternately asserted itself, and his extreme exactness and astuteness represented, as I have often thought, the reaction against the poetic and contemplative mood which occasionally predominated in him. The swing of his nature took him from extreme languor to devouring energy; and, as I knew well, he was never so truly formidable as when, for days on end, he had been lounging in his armchair amid his improvisations and his black-letter editions. Then it was that the lust of the chase would suddenly come upon him, and that his brilliant reasoning power would rise to the level of intuition, until those who were unacquainted with his methods would look askance at him as on a man whose knowledge was not that of other mortals. When I saw him that afternoon so enwrapped in the music at St. James’s Hall, I felt that an evil time might be coming upon those whom he had set himself to hunt down. “You want to go home, no doubt, doctor,” he remarked, as we emerged. “Very well. And, I say, doctor! there may be some little danger, so kindly put your army revolver in your pocket.” He waved his hand, turned on his heel, and disappeared in an instant among the crowd. 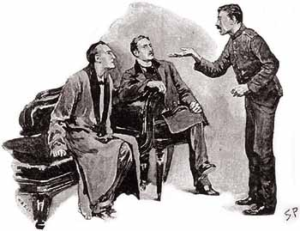 I trust that I am not more dense than my neighbors, but I was always oppressed with a sense of my own stupidity in my dealings with Sherlock Holmes. Here I had heard what he had heard, I had seen what he had seen, and yet from his words it was evident that he saw clearly not only what had happened, but what was about to happen, while to me the whole business was still confused and grotesque. As I drove home to my house in Kensington I thought over it all, from the extraordinary story of the red-headed copier of the “Encyclopaedia” down to the visit to Saxe-Coburg Square, and the ominous words with which he had parted from me. What was this nocturnal expedition, and why should I go armed? Where were we going, and what were we to do? I had the hint from Holmes that this smooth-faced pawnbroker’s assistant was a formidable man – a man who might play a deep game. I tried to puzzle it out, but gave it up in despair, and set the matter aside until night should bring an explanation. “You are not very vulnerable from above,” Holmes remarked, as he held up the lantern and gazed about him. I placed my revolver, cocked, upon the top of the wooden case behind which I crouched. 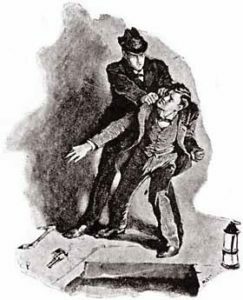 Holmes shot the slide across the front of his lantern, and left us in pitch darkness – such an absolute darkness as I have never before experienced. The smell of hot metal remained to assure us that the light was still there, ready to flash out at a moment’s notice. To me, with my nerves worked up to a pitch of expectancy, there was something depressing and subduing in the sudden gloom, and in the cold, dank air of the vault. “That is better,” said John Clay serenely. He made a sweeping bow to the three of us, and walked quietly off in the custody of the detective. “Had there been women in the house, I should have suspected a mere vulgar intrigue. That, however, was out of the question. The man’s business was a small one, and there was nothing in his house which could account for such elaborate preparations, and such an expenditure as they were at. It must then be something out of the house. What could it be? I thought of the assistant’s fondness for photography, and his trick of vanishing into the cellar. The cellar! There was the end of this tangled clew. Then I made inquiries as to this mysterious assistant, and found that I had to deal with one of the coolest and most daring criminals in London. He was doing something in the cellar – something which took many hours a day for months on end. What could it be, once more? I could think of nothing save that he was running a tunnel to some other building. “And how could you tell that they would make their attempt tonight?” I asked.